What Is An Electric Winch? An electric winch is a motorized device used for pulling or lifting. The typical auto winch is mounted to the vehicle’s front or reach bumper, and consists of a steel cable that winds around a rotating horizontal drum with a hook attached to the free end of the cable. A motor that drives the electric winch is attached to the vehicles electrical system for power. Electric winches are a specialized device, and not something that comes standard on most vehicles. For commercial applications winches are probably most frequently found in towing applications, where an operator needs to use a winch to drag heavy equipment or another vehicle onto a tow bed or trailer. Other service vehicles used in the power, telecommunication, and landscaping industries also frequently are outfitted with a winch. 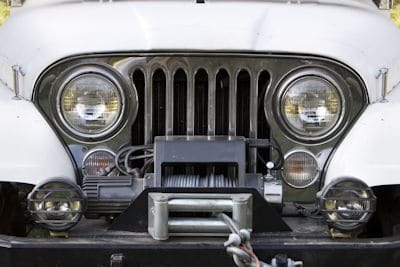 Winches purchased by consumers are mainly used on off-road vehicles, although amateur farmers and loggers also can find a lot of uses for an electric winch. All electric winches include motors that turn the drum that spools the cable. This motor is usually powered by direct current (DC) electricity provided by the vehicle’s electrical system. It operates like most other motors, with electrical current changes on opposite poles within the motor spinning a magnet that gives the motor power and turns the spool. Winches strong enough to pull a vehicle against resistance need to be heavy duty, which means they require a lot of current to operate. Because of that, many aftermarket electric winches require at least a special wiring harness, and in some cases electrical system upgrades to handle the load. The rotary motion created by the motor operates a gear mechanism attached to the drum. There are several different types of gear mechanisms utilized in electric winches, but they all perform the same basic function. Operating much the same as gears on a bicycle, their job is to multiply a lesser force applied over a large distance into a strong force applied over a short distance. The mechanical advantage gained by the various gear train configurations is what allows a winch to exert the force necessary to drag a heavy 4×4 vehicle out of the mud. Electric winches are not limited to trucks and 4×4’s. The exploding ATV market has ratcheted up demand for winches, with a large array of lighter duty models selling briskly for use on four-wheelers and similar all terrain vehicles. The boating industry also uses a lot of electric winches, as larger boats and motors make hand-crank trailer winches less practical.